Winter Solstice sunset outside Newark. The winter solstice has always been celebrated in China as the resting time of the year—a custom that survives in the time of rest observed at the new year. In winter the life energy, symbolized by thunder, the Arousing, is still underground. Movement is just at its beginning; therefore it must be strengthened by rest so that it will not be dissipated by being used prematurely. This principle, i.e., of allowing energy that is renewing itself to be reinforced by rest, applies to all similar situations. The return of health after illness, the return of understanding after an estrangement: everything must be treated tenderly and with care at the beginning, so that the return may lead to a flowering. 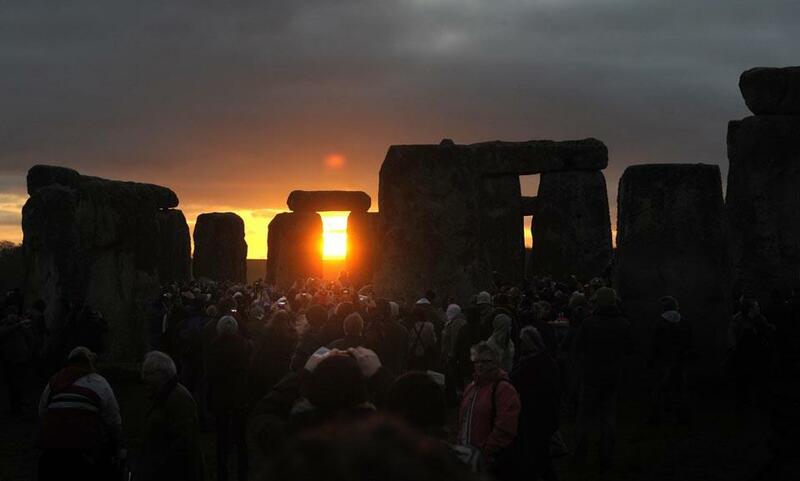 At 0530 this morning, the Winter Solstice, the shortest day, the longest night, occurred. The December solstice occurs when the sun reaches its most southerly declination of -23.5 degrees. In other words, it is when the North Pole is tilted 23.5 degrees away from the sun. Depending on the Gregorian calendar, the December solstice occurs annually on a day between December 20 and December 23. On this date, all places above a latitude of 66.5 degrees north (Arctic Polar Circle) are now in darkness, while locations below a latitude of 66.5 degrees south (Antarctic Polar Circle) receive 24 hours of daylight. In layman’s terms the Winter Solstice is when the sun is at its lowest elevation in the sky. At the Tropic of Capricorn the sun is directly overhead. Stonehenge, a huge astronomical clock on Salisbury Plain in Wiltshire, is aligned on the Winter Solstice. The Mayan Calendar ends one of its great cycles December 2012, which led to a mistaken belief the world was due to end at 11:11 GMT on 21 December 2012. The world is not due to end, one cycle ends and a new cycle begins. For the paranoid a live countdown. Amaterasu by Gareth Hinds, his second painting with ArtRage. This is the Japanese sun goddess Amaterasu, who shut herself in a cave when her brother Susano-O went on a rampage.